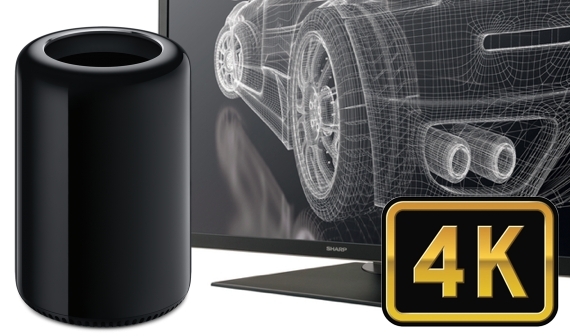 With Apple’s release of the long awaited new 2013 Mac Pro today , third party peripheral manufacturers are gearing up to release their own complimentary 4k displays and Thunderbolt 2 accessories…and all can be included within a competitive flexible lease that can make the somewhat expensive 2013 Mac Pro very affordable. Apple have claimed the Mac Pro will run three simultaneous 4K displays allowing you in their words to “work pixel-for-pixel in 4K without slowing down, thanks to dual AMD FirePro workstation-class GPUs and the latest Xeon E5 processors in Mac Pro — a merger that delivers the breathtaking capability to run three streams of 4K video at once”. The Mac Pro will be a behemoth in the video editing arena. And with Apple making loud noises about the Mac Pro, but zero noises about a new display it is becoming more and more likely that if you want to run 4k displays on the Mac Pro’s release a third party screen is what you will be using. Apple are using a Sharp IGZO 4k display on their website in all their images and is on the Apple Store to buy. This basically means Apple aren’t offering a 4K display themselves- contrary to the rumours. Not all 4K monitors are compatible with the Mac Pro though, with Eizo’s downscaling offering only supporting Windows and DisplayPort. 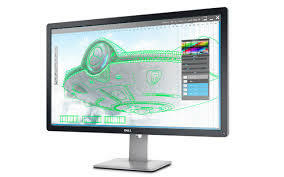 One of the biggest players first to market 4K displays the UK is Dell who have been quietly making great screens for a number of years now. Dell will have two models lined up for the Mac Pro launch, an Ultrasharp 24” (UP2414Q) and an Ultrasharp 32” (UP3214Q) model. They will be running the Ultra HD resolution 3840 x 2160 (as opposed to the Cinema 4K standard of 4096 x 2160) with the ability to connect via Mini DisplayPort or HDMI. The screens also have USB thrown in as well as a card reader on the 32” option. The 24” launches on December 16th with pricing to be but the 32” is available now and will add £22.90+VAT per week to a business lease . Incidentally a display that conforms to the ‘cinematic 4k display’ standard could be in the realms of £15,0o0 to buy ! The Sharp IGZO PN-K321H offering is again a 32” Ultra HD option and has been around globally for a while, but has finally headed to our shores. It’s pricier with less tricks in the box but does include an impressive 6 hour response three years business warranty, pricing is £31.80+VAT per week on our lease option. That includes three years warranty. This is the offer on the Apple Store. The new 2013 Mac Pro also sees a shift away from internal expansion to external expansion making full use of Thunderbolt 2’s superfast data transfer speeds and the very handy daisy chaining. For those in the dark Thunderbolt 2, Thunderbolt 2 offers a fantastic 20Gbits/S data transfer and you can connect up to six devices on one port via daisy chaining. Going back to the Mac Pro culture shift, it has 6 Thunderbolt 2 ports, allowing you to connect 36 devices at once ! Whilst this unlikely to be your average setup, it is pretty impressive for a box about 20cms high. 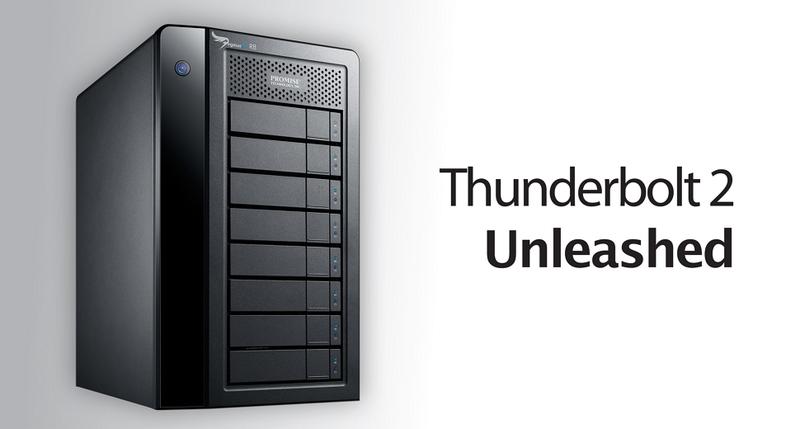 As such Thunderbolt 2 works rather well with 4K, so all the usual players have updated their products in preparation. In the I/O market Blackmagic have recently released the latest in their popular Ultrastudio range with the Ultrastudio 4k with Thunderbolt 2 (catchy name !). Not only is it packed with all the features you will need to capture 4K it also comes in at budget conscious £6.80+VAT per week on a three year lease. Whilst the first storage announcements came from Apple’s pals Promise with the Pegasus2. Now sporting a darker aluminum finish the Pegasus2 comes in 8TB – 32TB capacity options and allows the simultaneous transfer and display of 3d and 4k. Pricing hasn’t been announced but we expect the range to start from around £9+VAT per week upwards. For those with bigger fish to fry Promise’s SanLink2 is also due in December. This will allow you to connect Fibre Channels SANS to your Mac Pro with Dual 8GBps Fibre Channel ports. All in all the Mac Pro looks likely it will re-establish Apple’s dominance within the video editing market. HardSoft have been established for over 20 years and the business leasing is tailored for the video professional and offer the ability to upgrade or cancel after 2 years. HardSoft will continue into 2014 as Official Sponsor of the ‘Guild of Television Cameramen’ . The Apple Mac Pro will be available from launch starting at £21.60 plus VAT per week on a three years HardSoft Flexi lease. That lease price includes an Apple keyboard & mouse and our free 500GB Cloud Backup. Deliveries start early January and we already have a waiting list. For any questions call our Apple trained staff who will be happy to help.